I photographed this wedding at Southern Oaks Plantation in New Orleans way back in 2007, but this photograph from the reception remains as one of my top ten favorite shots ever... I simply love everything about it. I shot it very tight to capture without distraction the love this groom clearly felt and was not ashamed to show for his beautiful bride as he cried during the first dance. Southern Oaks is one of the most popular wedding venues in New Orleans for both locals and destination couples. While it's not located in the heart of the French Quarter, this is actually one of its biggest advantages, as transportation logistics are often simpler than trying to get hundreds of guests from an uptown church through the pedestrian-crammed streets of the Vieux Carré. Or you can do as most couples choose to do do and have your ceremony here as well, on the front steps of the stately home. 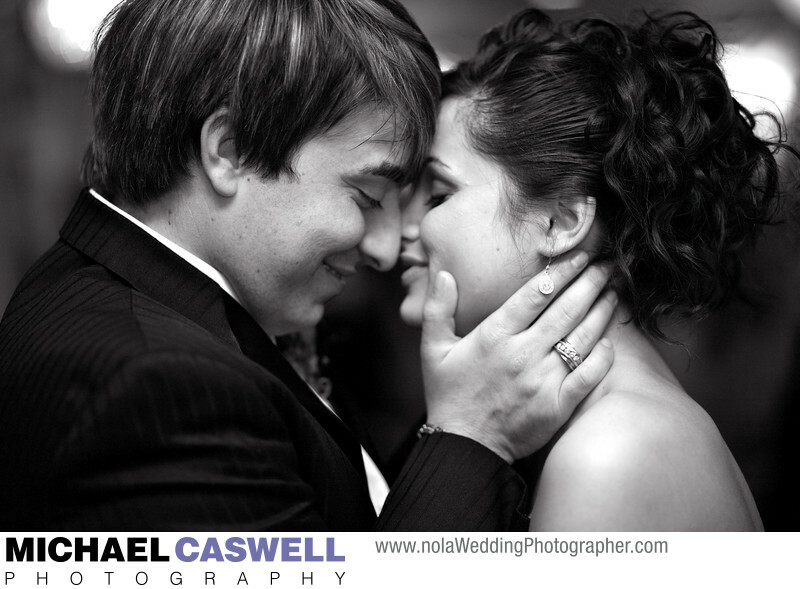 Either way, the well-trained, dedicated, and friendly staff at this facility make the job of New Orleans wedding photographers and videographers much easier by taking care of keeping everything on schedule, and by ensuring the couple and their guests have a purely enjoyable event (happy, unstressed people are easier to photograph!). The staff always does an excellent job in communicating the details and timing of various aspects of the reception, such as when the cake cutting, bouquet and garter toss, money dance, etc. will occur. As a photographer, I appreciate that there is a specific room set aside for the formal group photos, and that the family, bridesmaids, and groomsmen are ushered into this room immediately after the ceremony (with this area having its own bar and food tray passes), which allows the formal photographs to be completed quickly and efficiently. In addition to being a beautiful and elegant venue, the staff always goes above and beyond to ensure everyone has a wonderful time, and you come away with the impression that every facet of the overall experience has been carefully curated and choreographed by the owners, giving every event a truly fairytale-like feel. I don’t think I’ve ever photographed a wedding here that did not result in the couple, their family, and their guests being completely delighted afterward. There are numerous standard and optional amenities available for events here. For receptions without a band, a fantastic in-house DJ is provided, who always does a great job. 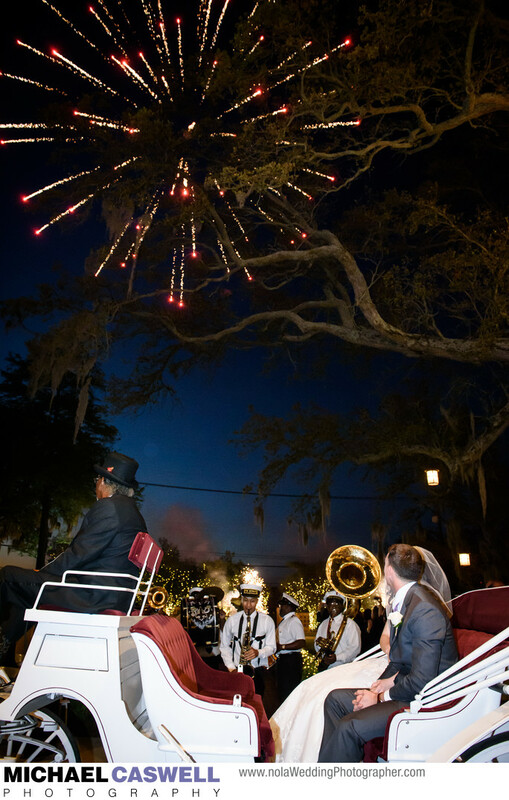 Want a brass band to lead you and your guests in a second line parade into the plantation at the end of the ceremony? Or perhaps a sushi chef, Cafe du Monde beignet truck, char-grilled oysters from Dragos, or snowball stand for your reception? No problem. 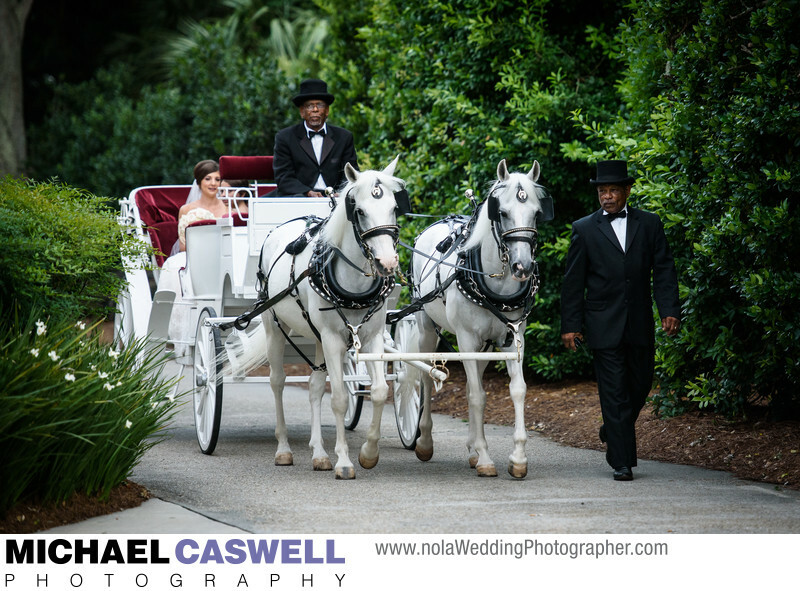 But there are also options that you will not find at any other New Orleans wedding venue, such as their signature horse-drawn carriage for the ceremony, a full-blown Mardi Gras parade (complete with floats and beads! ), and, perhaps most impressively, a spectacular fireworks show at the conclusion of your ceremony (or, in some cases, at the end of the night, after the reception if the timing works better that way).